If you have a small bedroom, one of the trickiest parts of decorating it is trying to figure out how to fit a bed into the space. 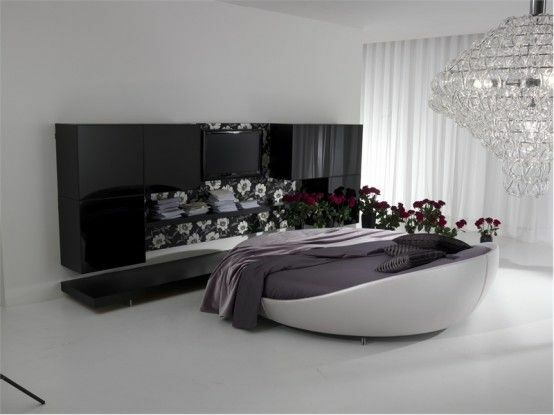 Larger beds mean little room to walk around the bed and even smaller amounts of space for other furniture. Worse, a traditional bed makes all the space above and below the bed unusable. So whether you have a small space, or you’d just like to use the space in a large bedroom more wisely, below are several ideas for small space beds. These open up the space by raising beds off the floor, adding storage and other creative options. Small space beds can make use of the smaller space with fold-out options. One example is the bed above, with another twin mattress that slides out from under the first mattress. It’s a great option if you tend to have company over. The headboard also folds down to reveal added storage and a small desk space, ideal for laptops. As a side note, the design above shows how some creative blankets and sheets can add to the design. The print text sheets on the bottom and the bright orange covers on the top add some visual interest to the space. As mentioned above, the problem with most beds is that you lose all the space above and below the bed. With this design, the bed is raised on a platform that incorporates storage, so you’re still keeping plenty of usability in the space. Loft beds often raise the bed right up to the ceiling, making the bed space itself feel cramped. This design makes a good compromise by raising the bed halfway off the ground so you’re still getting that under-bed usable space, but you’re not risking banging your head on the ceiling while getting into bed. Another creative idea for small space beds is the bed hut above. If you don’t have a lot of space for a guest bedroom or a master bedroom, a bed hut allows for sleeping space without taking up more room than the bed itself does. By simply placing a large bed in an alcove, you’ve created a little bed hut. A necessary feature, however, is some kind of way for anyone sleeping there to add some privacy. A simple curtain allows for that privacy. And so the space doesn’t feel so cramped, it’s also a good idea to try to have the bed nook next to a window. Bunk beds are usually a mainstay when trying to cram as much sleeping space as possible into a room. What makes the space in the photo above unique, however, is the bunk bed and the mattress up under the window. Simple wiring helps keep the topmost space safe from falls. Again, the use of the window helps the uppermost sleeping space feel less cramped. And accessing the top sleeping area by a ladder leading off the bunk bed gives the space a playful triple-tier design. This also proves it’s possible to use every part of a space in fun and functional ways. Usually, areas with steeply slanted roofing would get regulated to pure storage or maybe not even be used at all. Loft beds will always be a favorite for small space beds. What makes loft beds work so well is how much storage you can put under them. The space above shows the full array of storage options: from a multitude of drawers to cabinetry. There’s even space for a small desk area. A traditional bed in the area would mean losing all those storage options, so a loft bed is a smart choice for small spaces. 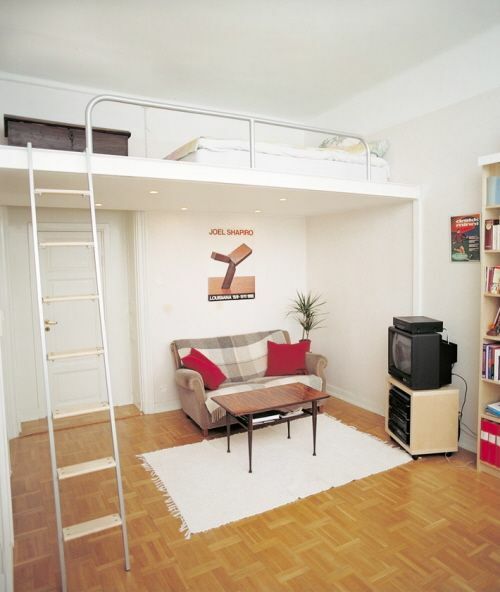 And if the bedroom is small enough, using a loft bed might be the only way to fit a usable desk area into the space. Loft beds don’t have to be all cabinetry and desk space, as the photo above shows. You can create just about whatever you want in the space under the loft bed. Obviously, you could have a desk space, but a comfy relaxation nook with a beanbag is also an option. Other options include a general play area, an arts and crafts workstation, a place to play video games or a cozy reading nook with a love seat. Some simple curtains under a loft bed give the space a sense of privacy. They also partition off the space under the bed to feel more like its own separate room, which can be helpful in shared bedroom spaces.